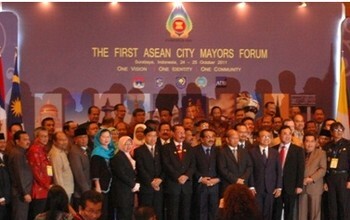 The ASEAN Mayors Forum (AMF) will take place in the provincial capital of Makassar in South Sulawesi next 9-11 September 2015. This event will be co-hosted by Makassar City Government and United Cities and Local Governments Asia-Pacific (UCLG ASPAC). The 2nd ASEAN Mayors Forum will discuss key policy frameworks and instruments, facilitate knowledge sharing and mutual learning among mayors and a number of international organization working in the field to foster sustainable development to achieve stronger community in ASEAN region. It is expected that local governments can learn from their peers thereby mutual partnership can be developed in the region.